In late March we published a longer term view of ethylene. Our focus was on what we still believe will be a weakening second half of 2016, possibly more accelerated if Europe is weak – a concern raised by CAT on its call yesterday. While May/June showed the expected peak and initial decline, July has bounced back globally because of ethylene plant production issues, keeping supply tight globally. The sector generally trades with near-term fundamentals rather than longer-term, unless valuations are at a floor. Consensus is still calling for pricing weakness through 2016, despite July, and we believe that natural gas prices in the US have significant near-term upside risk. While there have been some interesting valuation dips in LYB and WLK recently we do not believe that now is the time to take a “buy and wait” position, with significant revision risk to the downside likely for the next 6-9 months. We believe that Dow(DuPont) will outperform LYB and WLK because of the deal synergies and company specific cost initiatives, but sharp revisions based on weaker polyethylene margins near-term could create a better entry point for all. Our longer-term conclusion in March was that while the US was adding capacity at an unusual pace, the World was not, and that post 2017 there could be a global upward trend in profits again. We also predicted another round of capacity additions in the US, mainly because it was not obvious where else someone might build, given the importance of abundant low value feedstock – this would be capacity starting up post 2020/2021. This week’s announcement by Exxon and SABIC that they are evaluating a new JV for ethylene and derivatives for the US supports our longer term conclusion. We would not be surprised to see a similar announcement from DowDuPont within the year, possibly in JV with Dow’s new partner in Saudi Arabia, ARAMCO. DowDuPont may opt for Argentina first, as the country appears to have enough shale based NGL’s to support a second large ethylene unit, but another North American based investment is inevitable in our view within 5 years. DowDuPont and Exxon are being driven by the demand growth for their “high end” polyethylene, which is in high demand and outpacing the more commodity grades. The other players in this more value added end of the polyethylene market are Borealis and (to a lesser extent) Nova and we would expect to see some announcements here also, again possibly in North America. Despite the rig count decline, the fall in oil prices and some strengthening in natural gas pricing, North America remains the more obvious place to build ethylene – weighing up all the possible risks and rewards versus other locations. 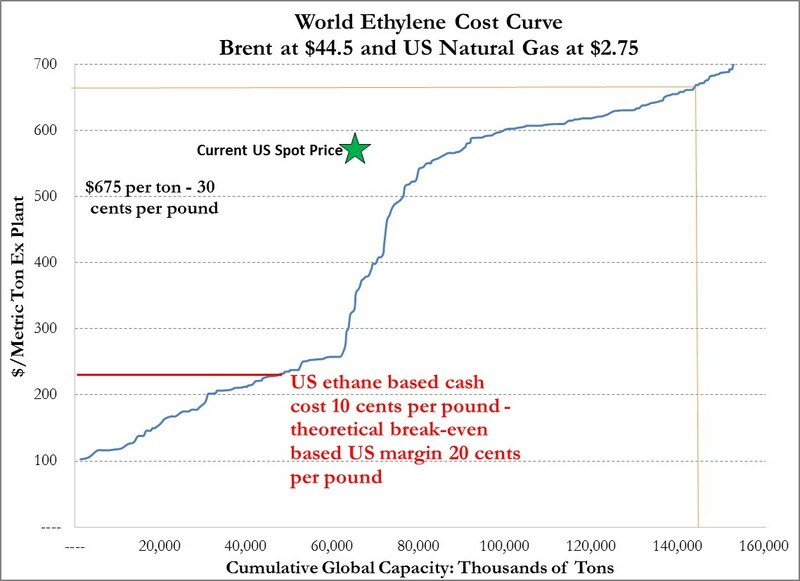 Even at today’s energy prices and significantly discounting natural gas pricing and associated ethane pricing in regions where LNG costs have collapsed you still get a cost curve favorable to the US – Exhibit 1 – albeit not as favorable as it was. Other polyethylene producers, Lyondell, CP Chem, Ineos, Formosa, Total, Braskem, Repsol and possibly Shell as a re-entrant (Marcellus), do not have enough of a “higher value add” business to need to build in order to protect market share and it is unclear what they will do. We still believe that another round of consolidation is needed in this group. The major risk to investment in the US is the need to export almost everything new produced here, given a large net export position already and slow domestic growth. There is potential to move significant polyethylene conversion capacity to the US from Asia, given the very high level of US imports of finished goods made from plastic, but this would require a focused initiative (including favorable polymer pricing) in order to encourage the investment in the US. Without such an initiative the US will have to expand container export capacity even further if another wave of ethylene investment follows the one underway today. Given the short-term mindset of the market, it is possible that companies and investors will focus on the better July data during up-coming conference calls rather than the risk of slower economic growth and rising natural gas prices in the US relative to crude oil. The greater leverage (and therefore volatility) sits with LYB and WLK. We do not have strong enough conviction to either buy or sell either name for an earnings season trade, but we think both will likely provide better absolute and relative entry points later in the year.